Coming earlier this year than ever before, the Journey to Easter, produced by the Edgefield United Methodist Church, will be a one-time showing at the Kendall Mill Building on Sunday, April 6. It will be held at 3:00. Always a popular and inspirational event, it will include all parts of the Easter story under one roof – unless there is good weather and the live animals and “market” will be outside. The actual journey from the first production eleven years ago to today is an interesting story. Because it is such a special event for the public, this newspaper sought an interview with some members of the church who have followed its history in order to hear of how it began and how long it has sustained as a popular religious event. It all began in the church building itself, under the leadership of Rev. and Mrs. Cooley. The idea was to augment the traditional Easter egg hunt (held at the church for many years) into a teaching event for the children and families, to put into rooms live tableaux of the events leading up to the crucifixion of Christ (Jesus riding on a donkey – live donkey at times; his carrying the cross; the Upper Room and Last Supper). There was not a Resurrection scene, for the Journey to Easter always preceded Easter Day. As more and more people attended, they added a way to teach about the culture of the time by having a market where members of the church dressed in the attire of the day and “sold” pottery and baked goods. This Journey to Easter grew under the Bouknight pastorate, even larger. Last year, under their new minister of two years, Rev. 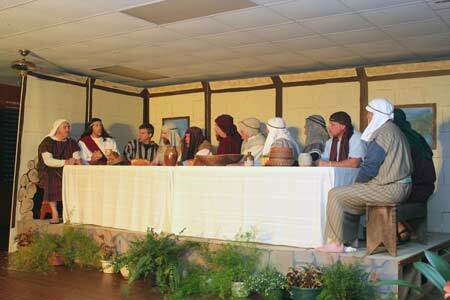 Canon, they took this Journey to the American Legion Hut where they turned it into a play and more music was added — as opposed to tableaux — with spoken dialogue depicting Christ’s journey to the cross. There was a seating of the audience for two plays, and the “market” was held in the nearby Scout Hut. There were so many attending that they had to have standing room available. With that success, they decided to move the entire event into one space, Kendall Mill building, with only one performance. There the market can be outside or inside, and if outside, they will have live animals of the day to enhance the realism of the event. This is an event open to all, and it is being held prior to any of the Easter observances leading into Easter morn.